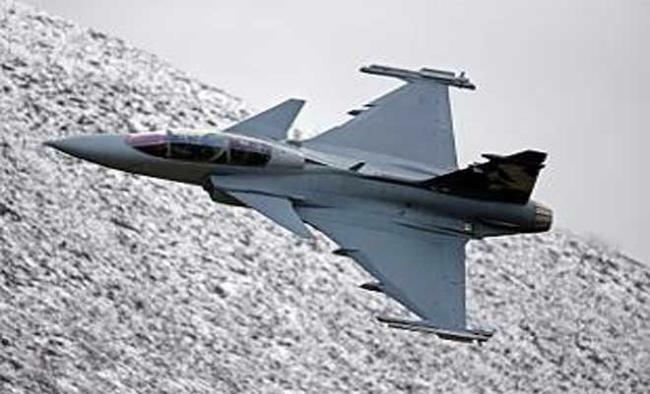 New Delhi: Swedish aerospace major Saab says it would set up a brand new production line in India if it wins an Indian Air Force (IAF) contract for single-engined combat jets and would make the country a net exporter of such fighters -- once the necessary procedures are in place. "I think we are the only one right now who is developing brand new next-generation fighters. Even if we are single-engine, we have capability matching any of the other twin-engine aircraft that would be on the market," Jan Widerstrom, Chairman and Managing Director of Saab India, told IANS in an interview. Saab has fielded its next-generation Gripen E fighters in response to a communication to global manufacturers for their offer for what could be up to 100 jets. The Grippen, in fact, was among the six jets in the running for an IAF tender floated in 2007 for 126 medium multi-role combat aircraft (MMRCA). The bulk of these aircraft were to be manufactured under licence in India. After protracted trials, the choice was narrowed down to two and then to one -- Dasault Aviation's Rafale. With the price negotiations going nowhere, the tender was eventually scrapped and the IAF opted for an off-the-shelf purchase of 36 Rafales. The final contract was inked only in September 2016 and the jets will begin arriving in September 2019, with the order expected to be completed in 30 months. Meanwhile, the IAF has also decided to purchase an additional 83 of the indigenously developed and manufactured Tejas light combat aircraft (LCA) when its original intent was to induct only two squadrons (36 aircraft). In the midst of all this, the IAF has seen its strength dwindling from the sanctioned 42 combat squadrons to 25 -- with the best it has achieved being 39. This is largely due to the phasing out of Soviet vintage Mig-21s, MiG-23s and Mig-27s and the unserviceability of many aircraft due to the lack of spares after the collapse of the Soviet Union. Hence the latest proposal to purchase in the region of 100 jets. These aircraft are expected to be manufactured in the country under the Make in India initiative. "We are ready to offer full technology-transfer and build-up capability in India not only for manufacturing and production," Widerstrom said, adding: "We are not planning to move an old production line to India. Our offer is to build a brand new production line for the next generation fighters and the next after that. This will be putting India on the aerospace map as a net exporter of fighters." There is, however, a catch. The export of lethal weapons and systems is a rather gray area, with the Defence Ministry only recently setting in motion the process through which this could be done. Given that India took 25 years to purchase an advanced jet trainer and that the process for the Rafale has taken almost a decade, this could be a prolonged exercise. Widerstrom was unfazed. "We would definitely like to see India as a regional manufacturing hub for Gripen global orders in the future. We will fully comply with the Indian government's regulations on export of defence equipment." The company believed the aircraft "would certainly be a good fit for India's requirements". "Our business model is to work through partnership with countries and companies. We have the full backup of the Swedish government on this," Widerstrom noted. "India will be part of our global supply chain. We have a European hub in Sweden. We are building up a hub right now in South America in Brazil, supporting that part of the market. What we want here in India is a third hub supporting this part of the market," said Widerstrom.